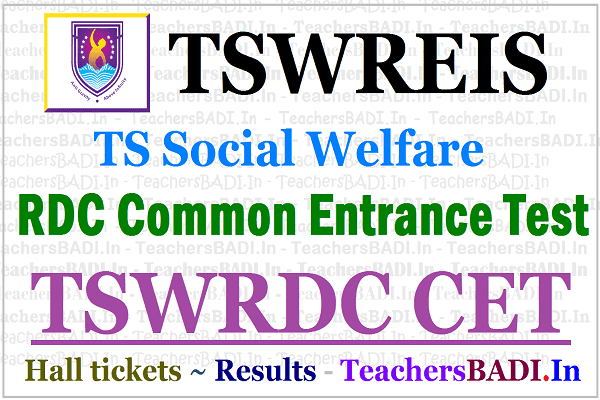 Tswreis RDC CET 2019 |Tswrdc Entrance test Hall tickets, Results, Counselling dates 2019 / Tswreis RDC CET 2019| TSWRDC CET /#TSWDCET, TSWRDC Entrance Test 2019 Apply Online: Tswreisrdc cet 2019, Tswreis RDC Entrance test 2019, TS social welfare RDC admission test 2019, Tswreis residential degree colleges admissions, Hall tickets, Last date for apply online, How to fill online application form, results, merit list, exam date, tswreis.telangana.gov.in, Tswrdc cet 2019, Tswrdc admission test 2019, Tswrdc Entrance test 2019, Tswreis Degree admissions and more details @ tswreis.telangana.gov.in. TSWRDC Entrance Test 2019: Telangana Social Welfare Residential Educational Institutions Society(TSWREIS) has issued the TSWRDC Common Entrance Test(TSWRDC CET) 2019-18 Notification on February ...., 2019 and the TSWREIS invites online applications from the eligible Women (Unmarried)?/Women candidates from Telangana State for admission into Degree first year courses in its TS Social Weflare Resindetial Degree Colleges for the academic year 2019-2019. With a view to augment the facilities to girl students to continue the higher studies after Intermediate and to provide quality education for Girl students, Government of Telangana have sanctioned a Residential Degree College for Women in all districts of Telangana State. The College will commence from the academic year 2019-2019 under the jurisdiction of TSWREIS, Hyderabad. The medium of instruction will be English. TSWREIS Clarifies on inviting applications from unmarried women: The spirit behind saying unmarried women is to facilitate admission “straightaway” for eligible girls who complete the age of 17. After its notification inviting applications from “unmarried” women for admission to degree courses created a row, a Telangana government body on ....-03-2019 clarified there is no bar on married women from applying. The notification, issued by the Social Welfare Residential Educational Institutions Society (TSWREIS) on ...-03-2019, raised eye brows as it mentioned that applications are invited from (unmarried) women. The TSWREIS invites applications from women (unmarried) candidates for admission into B.A/B.Com/B.Sc 1st year Degree courses for the academic year 2019-2020. The candidates are requested to visit the TSWREIS website www.tswreis.telangana.gov.in for application form, prospectus and eligibility criteria. The TSWREIS officials said there was no bar on married women from seeking admissions. The spirit behind saying unmarried women is to facilitate admission “straightaway” for eligible girls who complete the age of 17, TSWREIS Secretary RS Praveen Kumar said. In this particular instance, it was erroneously understood that we are totally preventing married women joining our residential degree colleges. Our girls will be of 17 years of age when they complete 12th grade and we expected them to join our residential degree colleges straightaway. This was the spirit behind the notification and we clarify that we don’t deny anyone admission on her marital status,” TSWREIS Officials. Official stated the Society was “deeply committed to overall development of our girl students, their safety, their studies, and life-changing careers at this critical stage of their life.” TSWREIS is a educational institution, which organises a number of social welfare residential schools in Telangana. 1. Students appearing for Senior Intermediate Examination to be held in March, 2019 to be conducted by Board of Intermediate Education of Telangana State or equivalent to it and who have secured 40% or more marks in the 1st year Annual 2017-2019/Advanced Supplementary 2017-18 Examinations are alone eligible to appear for the test. MPC Test 1– EMPC 1. English, 2. Maths, 3. Physics, 4.Chemistry B.Sc (MPC), B.Sc (MSCs) and 5 other B.Sc. courses of physical Sciences offered at TSW Residential College of Physical Sciences, Budwel, B.A (HEP) and 6 other courses offered at TSW Residential College of Social Sciences, Ibrahimpatnam, B.Com (Gen), B.Com (Comp) and 5 other courses offered at TSW Residential College of Commerce, Sangareddy. BPC Test 2– EBZC 1. English, 2. Botany, 3. Zoology 4.Chemistry B.Sc (MPC), B.Sc (MbZC) and 5 other B.Sc. courses of Life Sciences offered at TSW Residential College of Life Sciences, Mahendrahills, B.A (HEP) and 6 other courses offered at TSW Residential College of Social Sciences, Ibrahimpatnam, B.Com (Gen), B.Com (Comp) and 5 other courses offered at TSW Residential College of Commerce, Sangareddy. MEC Test 3– EMAC 1. English, 2. Maths 3. Accountancy 4. Commerce B.Sc (MSCs), B.A (HEP) and 6 other courses offered at TSW Residential College of Social Sciences, Ibrahimpatnam, B.Com (Gen), B.Com (Comp) and 5 other courses offered at TSW Residential College of Commerce, Sangareddy. HEC Test 5– EHEC 1. English, 2. History, 3. Economics 4. Civics B.A (HEP) and 6 other courses offered at TSW Residential College of Social Sciences, Ibrahimpatnam. B.Com (Gen), B.Com (Comp) and 5 other courses offered at TSW Residential College of Commerce, Sangareddy. 2. Question Paper (120 Marks) will be objective type. Multiple choice questions and the answers should be marked on the OMR Sheets. 3. The test will be conducted in TSW Residential Schools/Jr.Colleges located in 31 new Districts basing on the option given by the candidates. All eligible students are required to apply through online mode only at tswreis.telangana.gov.in (For Telangana Students) Steps to be followed in submission of the application through ‘Online’. 1. The candidate shall first go through the information bulletin carefully and satisfy their eligibility for appearing for RDC-CET 2019. 1. Candidates can download their Hall Tickets from the website at tswreis.cgg.gov.in from ...-04-2019 to .....04.2019 with the reference number allotted to them. 2. No printed hall ticket shall be issued/posted to the candidate. 3. No candidate will be allowed to appear for the examination without hall ticket. ~ Download the results and take the print for future reference.. Admissions into 1st year B.A./B.com/B.Sc. courses will be made on the basis of marks obtained in TSWDECT-2019. Candidates who have studied Intermediate or its equivalent course in any of the 10 Regions/Old Districts are eligible to take admission in the above 4 colleges. 1) The candidates have to obtain rank cards from the Society Website tswreis.cgg.gov.in. 3) The candidates who have completed Intermediate or its equivalent annual examination with a minimum of 40% marks are eligible for admission in to 1st year Degree courses. 4) Married Women candidates will not be considered for admission in to 1st year Degree courses. 5) Candidates whose annual income of the parents is more than Rs.2.00 lakhs in Urban areas and Rs.1.50 lakhs in Rural areas are not eligible for admission into 1st Degree Courses. 8) Appearing for the Entrance Test does not confer any right for admission. Applicants shall also fulfil other admission criteria stipulated by TSWREI Society, Hyderabad. 9) The Society reserves the right to change the rules of admissions as per the directions of the Government and University from time to time.